Do you have a playful pup who likes to escape from the yard? If so, you’ve probably wondered what the best wireless dog fence for you is. Budget can be a huge factor because both privacy fences and professional invisible pet fences can cost thousands. Fortunately the wireless dog fence options we’re presenting today are affordable and you can easily install them yourself. 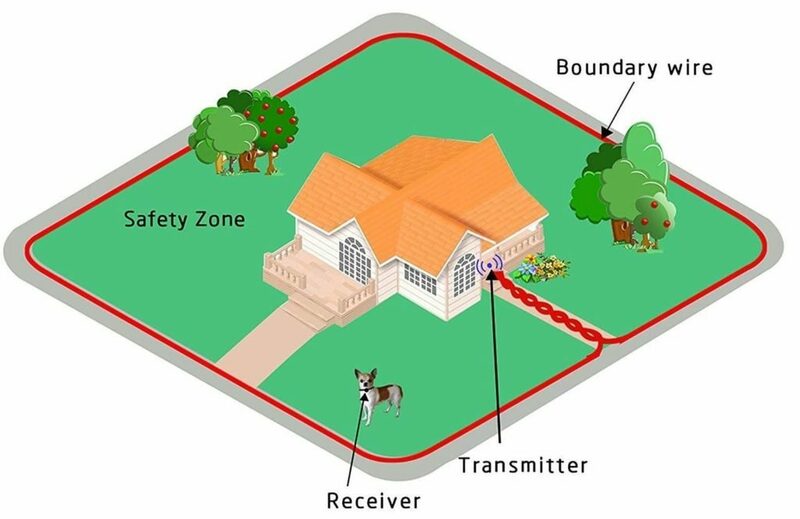 A wireless dog fence is a invisible boundary that uses static correction to contain your pet within a given area. They are controlled by a transmitter “base”, and a collar “receiver” worn by your pet. The boundary area is lined with small flags, used as a guide to teach your pet the perimeter lines. When the pet tries to leave the boundary limits, the collar emits a static correction to show the area is off limits. There are two types of wireless dog fences. The first type is Fully Wireless Dog Fence, which covers a circular area range to contain pets. The radius is created by using a wireless transmitter, and a collar receiver. These systems are easy to install, and are portable so you can use them while traveling. You can adjust the containment radius from the center of the transmitter, but the shape of the area is not customizable with the fully wireless system. An example of a fully wireless system is seen below. The second type is called an In-Ground Wireless Dog Fence. These fences use a transmitter base, and wiring around the perimeter you’d like to contain. Wiring can be placed in the ground, or with some systems, fixed to an existing above ground fence. The in-ground systems are much more customizable, however the installation time is more extensive, and the wiring can wear down over time and need replacement. An example of a in-ground wireless system is seen below. Which Type Of Wireless Dog Fence Is Right For Me? There are many factors which can help you answer this question. A fully wireless dog fence is generally best suited for people with who have a standard size area to contain pets. 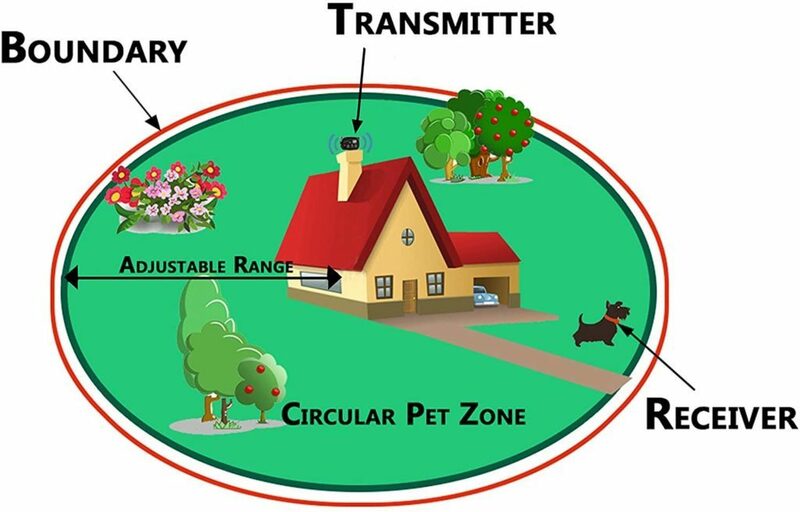 Since the transmitter is connected inside the home, the boundary will be a circular range starting from the transmitter. Homes that work best with a fully wireless fence have a uniform size front and back yard, without any “off limit” areas such as pools or sheds. Homes with rocky, hilly, and uneven terrain can cause the fully wireless range area to be smaller, and may not work as well. 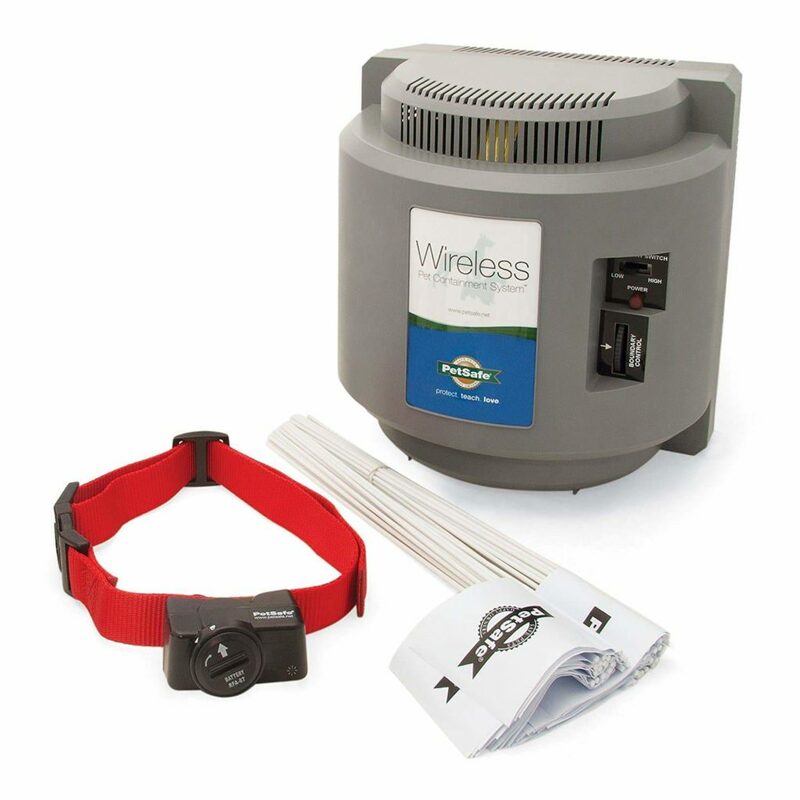 The fully wireless systems are very easy to set up, and they can be moved easily to a new home, or used on vacation to keep the pet contained. An in-ground wireless dog fence is best for people who need a customizable shaped pet boundary. Unlike fully wireless systems that use a circular shaped radius, the in ground system uses wiring to create the perfect shape. This is a great option for homes with “off limit” pools, gardens, or sheds in the yard, homes that need dual zone areas in the front or back of the home, or even beach side properties. These in ground systems are much more flexible, however the process of installing the wire can be lengthy. In ground systems also have a better reputation for containing very large or stubborn dogs, as the wiring is better at defining exact boundaries and delivering correction more quickly. As you can see, each type has there pros and cons. 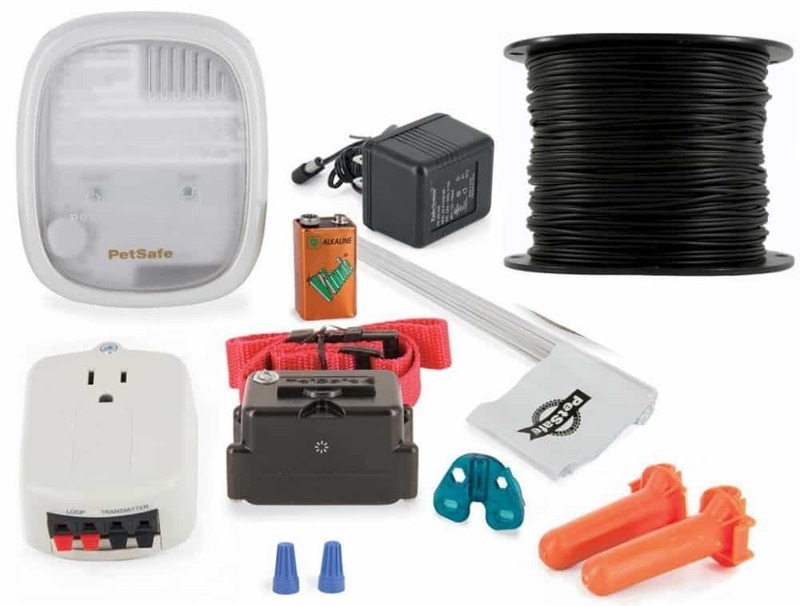 We have reviewed the top brands of each type of wireless pet fence system, so you can see which features work best for you and your pet. 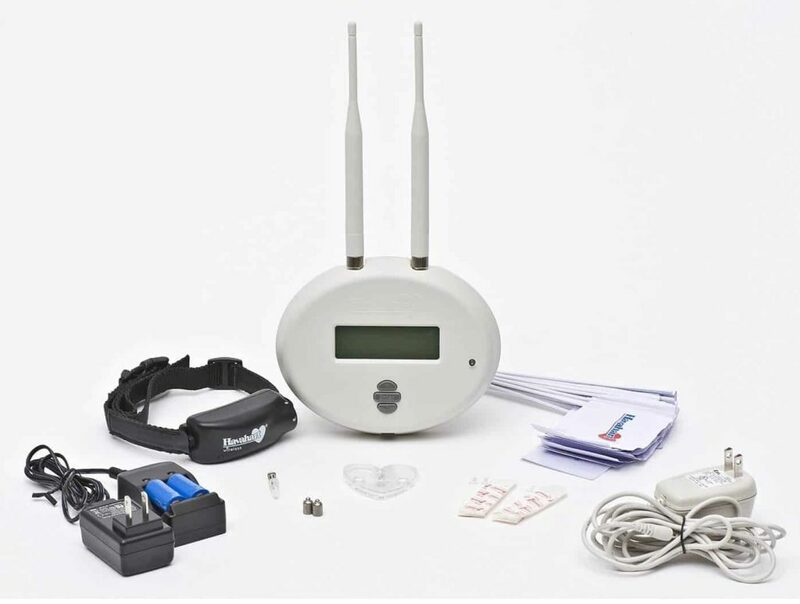 PetSafe is ones of the most trusted wireless fence brands. The PetSafe Free To Roam is very easy to install, and can be up and running within 1-2 hours. The range of the system covers 1/2 acre (180 feet in diameter) up to 90 feet in all directions. The waterproof collar offers 5 levels of static correction, plus a tone only training setting for pets to learn boundaries. You can add as many pets as you want to the system, but each pet must weight over 5 pounds. The collar uses RFA-67 batteries, which can be replaced, and generally last 1-2 months. 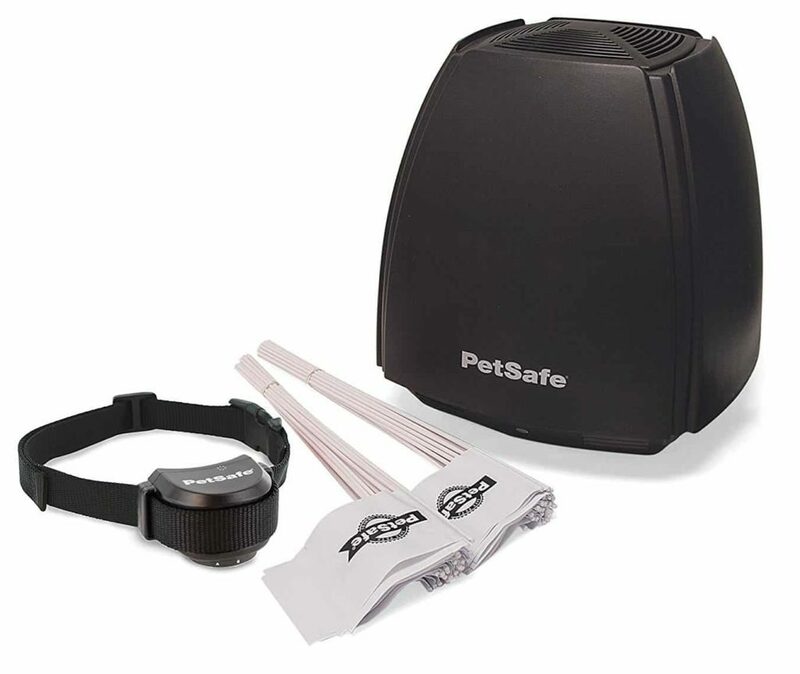 This system also has a low battery indicator on the collar, and a built in power loss alarm, so you can make sure your pet stays contained. 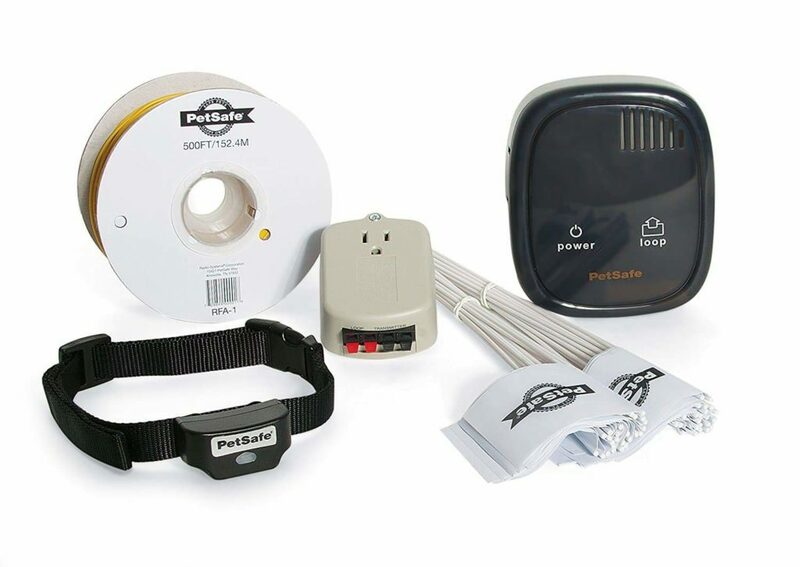 This wireless pet fence from M-Tronic is the latest version from their successful line, and comes with 2 collars. Perfect for a two dog home or as a backup, and you can add as many pets as you want to the system. It has a range of 3ft-800ft, and the transmitter features a built in battery. This battery will allow the transmitter to keep working up to 24hrs after loss of power. The collars are waterproof, with a rechargeable battery, and a low battery indicator light. Dogs must be at least 8 pounds to use this system, and the system has 4 levels of static correction to keep your pet contained. This pet containment system from Petsafe is one of their most popular, and covers a range of 5-90 feet in all directions. 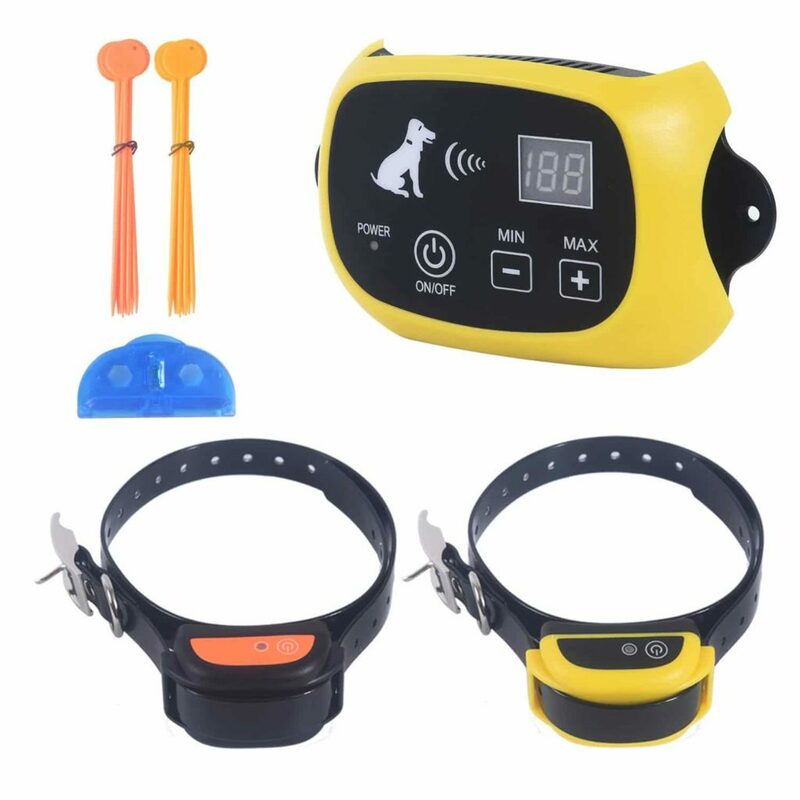 The waterproof receiver collar has a low battery indicator, and 5 levels of static correction plus a tone-only mode for training. Pets must be at least 8 pounds, and you can add an unlimited number of pets to the system. The system uses a 6-volt (RFA-67) battery which can easily be replaced. This system is also very easy to move around, and can be taken with you anywhere you’d like to keep your pet contained. The PetSafe Stay + Play is another popular choice from the PetSafe brand. This system has a range of 3/4 acre or up to 105 feet in all directions, and it very easy to set up. The collar is waterproof and rechargeable, and a charge lasts about 3 weeks. The Stay + Play has 5 levels of correction plus a tone training mode. The tone training mode is used to teach your pet the boundary area.This system is meant for pets 5 pounds or larger and you can add unlimited pets to the system with additional collars. Havahart is another brand that is very popular in pet fencing. This system comes in two sizes, one for smaller dogs, and one for medium-large sized dogs. Unlike other systems, the Havahart has a limit of two pets per system. It has an impressive range of up to 11 acres which is one of the largest available. The collars are waterproof, and feature 5 static correction levels, including a tone only mode. The battery for the collars is rechargeable, and this system can easily be set up in under 2 hours. The In-Ground fence system from SportDog is a great choice for large yards. It has a range of up to 1 1/3 acres with the included 1000ft of wiring. Additionally, the system is capable of controlling up to 100 acres with the purchase of additional wiring and flags. You can add an unlimited number of pets to this system, and the waterproof collars offer 4 levels of correction plus a tone mode. Pets must be at least 10 pounds to use this system, and the collar uses a replaceable 9-volt battery that lasts 6-12 months. This system also has built-in lightning protection, and a wire break alarm to keep pets safe. The Sit Boo-Boo wireless dog fence is easily installed, and has a range of 1.2 acres of land. If you purchase additional wiring and flags, this system can cover up to 5 acres of land. This makes the Sit Boo-Boo system another great choice for people with large yards. The collars are waterproof with a rechargeable battery, and 5 levels of correction. You can add a unlimited number of pets to this system, and they offer a lifetime replacement warranty. 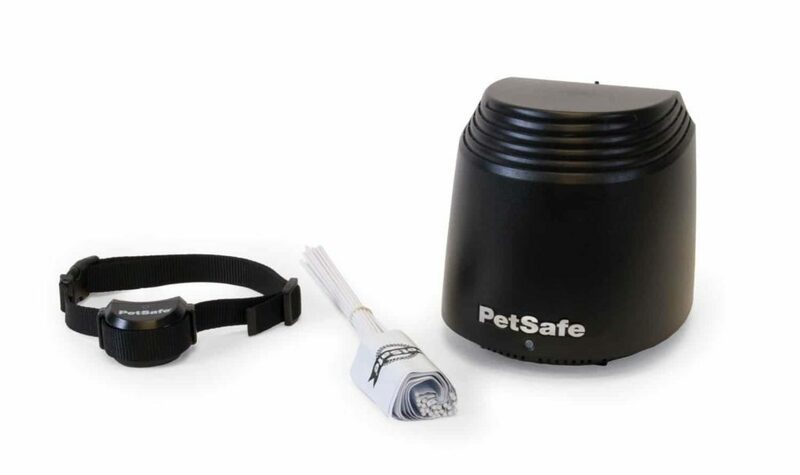 The PetSafe rechargeable in ground fence is another popular pick for many pet owners. 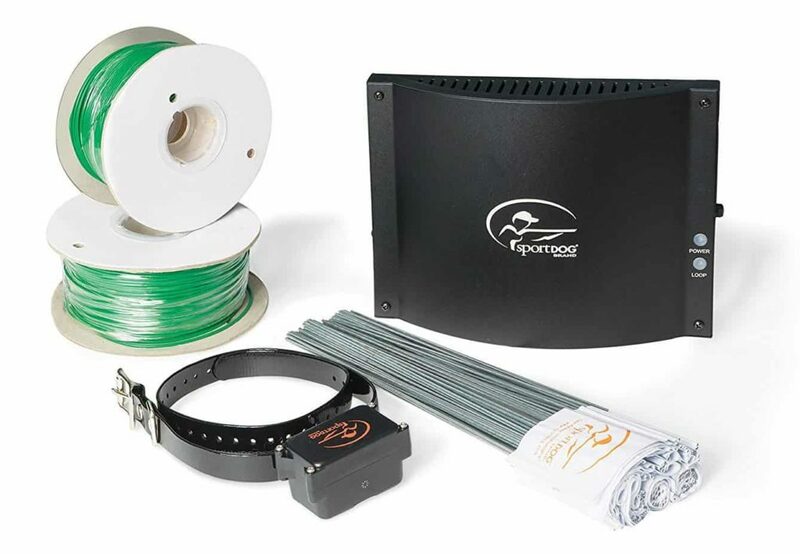 This system covers a range of 1/3 acre with the included wire. You can also expand the system up to 25 acres with additional flags and wiring. The collars have a rechargeable battery, and offer 4 levels of correction plus tone only mode. The transmitter has a built in surge protector helps protect transmitter from lightning strikes and power surges. You can add an unlimited number of pets to this system, but they must weigh over 5 pounds each. The best choice for stubborn pets, is the PetSafeStubborn Dog Fence. This system offers 4 levels of static correction, up to twice the strength of other systems. Because the strength of correction is higher, it more easily contains heavier and stubborn pets. The PetSafe stubborn dog fence has enough wire to cover 1/3 acre. You can also expand the system up to 10 acres with added wiring. The waterproof receiver collar uses 9-Volt alkaline batteries, and you can add unlimited pets to the system. Pets 8 pounds or more can use this system, and is recommended for stubborn, high energy, and heavy pets. Our #1 choice for best in ground wireless dog fence is The Extreme Dog Fence. The receiver collar is super lightweight at only 1.1 ounces, and the contact points are covered in a soft rubber to make the collar more comfortable your pet. 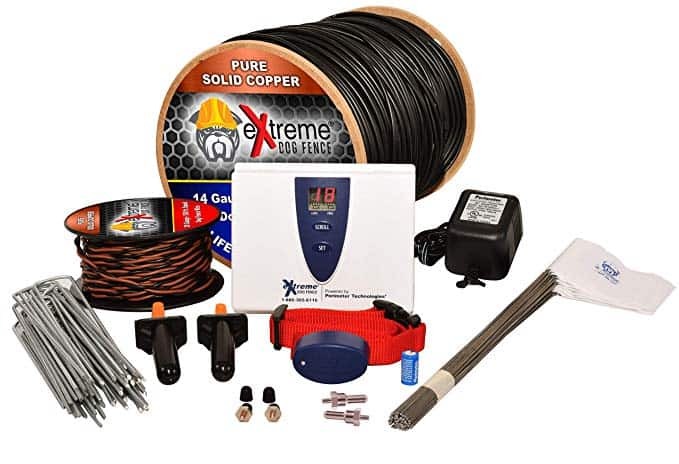 Additionally the the thick 14 gauge wire is covered in a sturdy polyethylene coating. What does this mean for you? No worries about a wire breaking down the road! This coating is both UV and water resistant, and can stand up to anything Mother Nature sends its way. The Extreme Dog fence is perfect for dogs weighing 8 pounds or more. It offers 7 levels of correction, as well as a beep-only training mode. One important thing to note is that the collar runs on proprietary batteries, and each one will last about 3-4 months. It’s a good idea to keep extras on hand so you can easily swap them out as needed. The final reason this one is our best pick, is that it’s manufactured in the USA! The friendly and reliable customer support is available 7 days a week, making this DIY project as easy as can be. 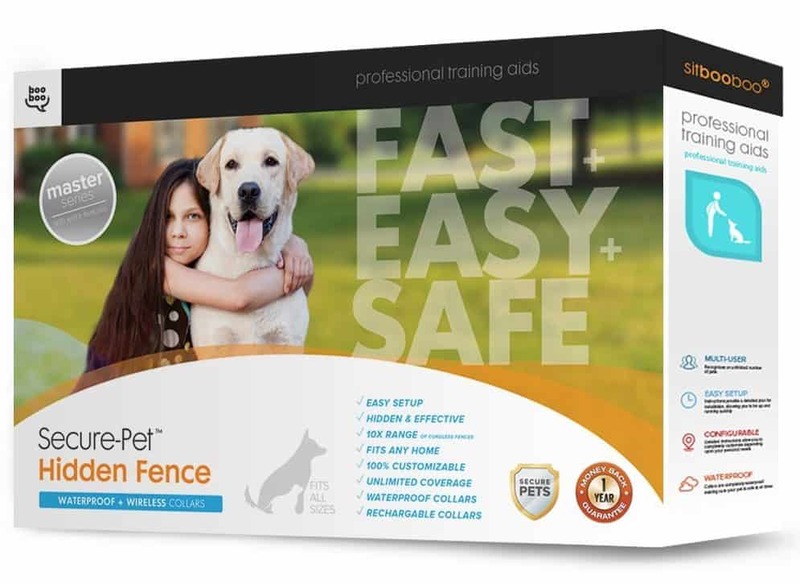 We hope you’ve enjoyed our review of the best wireless pet fences of 2019!